A directory to fee-mining for rocks, minerals, fossils, gold and treasure in the western United States. 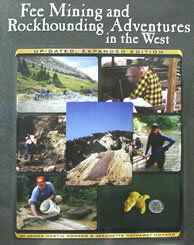 Rockhounding sites, caves, gold prospecting, mines, festivals, museums, and more. Updated and expanded second edition. 8 1/2" x 10 7/8" paperback, 240 pages. Have We Missed a Mine or Collecting Site?